I am an historian of the late nineteenth and early twentieth century United States, and I am especially interested in women’s and gender history, as well as the history of social movements. My dissertation research focused on a network of left-wing feminists in Progressive Era California that was unusual for its commitments to women’s economic independence and redistributive social policies. I explored radical women’s contributions to the gendered integration of partisan politics, and to feminist issues such as woman suffrage, protective labor legislation for women, the unionization of women, the creation of early social welfare policies such as mothers’ pensions and the legalization of birth control. I argue that socialist-feminists made key contributions to progressive reform in California which helped put the state at the forefront of social policies benefitting women. This research has been published in a number of essays and articles (see publications) and is currently being revised into a book manuscript. Another research project arose from the intersection of my interest in gender and my teaching of historical methods. These interests led to the publication of a collection of essays I co-edited entitled Contesting Archives: Finding Women in the Sources, which illuminated diverse methodologies for researching women. I am now at work on a new project that unites women’s historians and archivists in a conversation on how to increase the presence of women’s and gender materials in archives. 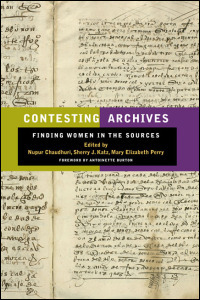 Contesting Archives: Finding Women in the Sources. Edited collection with Nupur Chaudhuri and Mary Elizabeth Perry. Urbana: University of Illinois Press, 2010. “`Researching Around Our Subjects:’ Excavating Radical Women.” Journal of Women’s History 20:1 (Spring 2008): 168-86. "`Redefining the Political': Socialist Women and Party Politics in California, 1900-1920." In We Have Come to Stay: American Women and Political Parties, 1880-1960, edited by Melanie Gustafson, Kristie Miller, and Elisabeth Israels Perry. Albuquerque: University of New Mexico Press, 1999, 23-32. "A Politics of Coalition: Socialist Women and the California Suffrage Movement, 1900-1911." In One Woman, One Vote: The Woman Suffrage Movement in America, edited by Marjorie Spruill Wheeler. Troutdale, Oregon: New Sage Press, 1995, 245-62. "Socialist Women and Progressive Reform." In California Progressivism Revisited, edited by William Deverell and Tom Sitton. Berkeley: University of California Press, 1994, 117-43.